Considering Shifting Demographics, How Will Houston Meet Demand For Skilled Workers? A new report commissioned by the Center for Houston’s Future raises concerns. It found three big factors that could limit growth: a region plagued by traffic and flooding, a diminished oil industry, and last but certainly not least, not enough educated workers. Houstonians live in the most diverse city in the country. “All the growth of Houston and of Harris County has been the influx of Latinos, African Americans and Asians,” said sociologist Stephen Klineberg of Rice University’s Kinder Institute. “This biracial, southern city dominated by white men throughout all of its history has become the single most ethnically diverse city in the country,” said Klineberg. As the city’s Anglo population gets older, immigrants and their children are replacing them. By 2030, Latino’s are expected to make up 43% of the city’s population. As Houston’s economy grew and needed more workers, immigrants were there – an almost perfect match. “What we found in some of the data is that the educational attainment levels of Hispanics tend to be lower, there are lower levels of graduation from high school, lower levels of graduation from college,” said Brett Perlman, CEO of the Center for Houston’s Future. Though many immigrants enter the country highly qualified, others come to Houston after living in poverty. For these immigrants and their children, making ends meet can be at odds with seeking higher education. Ramiro Fonseca is Community Engagement Manager for Project Grad, which helps Houston students prepare for higher education. Fonseca says he sees students and parents that work multiple jobs which can get in the way of college prep – and families that simply can’t afford to send a kid to college. But what’s needed for jobs in the future, and even right now, are educated workers, though not necessarily ones with 4 year degrees. “There are about a million jobs in the Houston economy that require more than high school but less than four-year college degrees, so that’s about a third of the workforce,” said Peter Beard. He oversees Upskill Houston, an employer-lead initiative to educate and train labor for middle skill jobs in petrochemicals, utilities, health and other sectors. Trio Electric is one of the employers Beard works with. A shortage of skilled electricians prompted the company to collaborate with Spring Branch Independent School District. The first class of high school juniors participating in the program are about to wrap up their first year. That means they are about a fourth of the way done in a pre-apprenticeship program to train to become electricians. 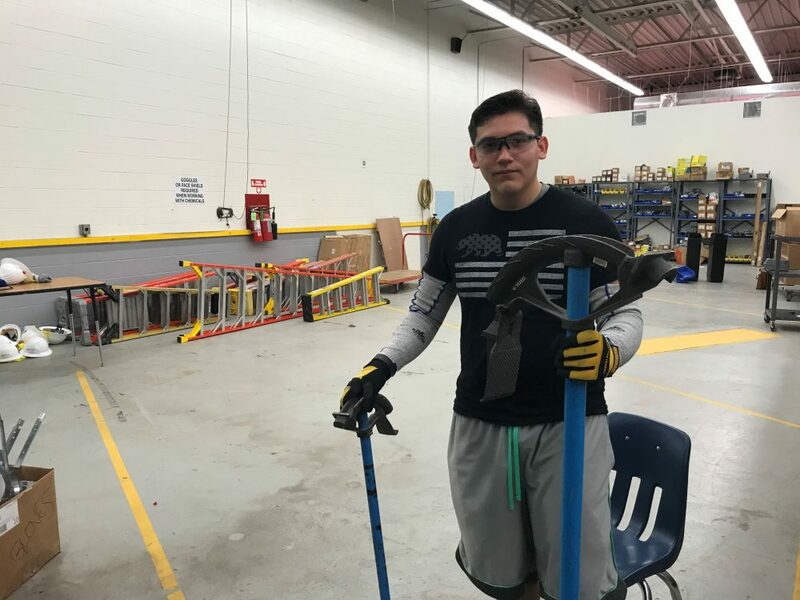 Junior Daniel Aleman is planning to stick with the program all four years to become an electrician. He said electrical tech is his favorite class and he enjoys working with his hands. And he is confident what he’s learning will lead to a good job. “I’m just looking forward to the work,” said Aleman. Aleman already works two jobs outside of school. And he’s about to begin a paid summer internship with Trio, which is part of the apprenticeship program. “If I get to work in the internship, my brother won’t be the only one paying everything, so I could just help him out pay the bills… help my mom pay the bills,” said Aleman. If Aleman finishes the Trio program, he’s looking at a starting salary of over $50,000. And for students who decide the program isn’t for them, the high school electrical tech certificate also can transfer to Houston Community College. This is the first year of the electrical tech class at Spring Branch ISD. Around 50 new juniors from local schools will start next year.